Having perfected his formula for milk chocolate and contructed the factory three decades earlier, Milton S. Hershey was presented with a dilemma during the Depression. Hershey was faced with the prospect of either employing his town's construction workers or providing for their welfare. Strongly objected by his close friends and associates, who urged him to conserve his resources, and his mother, who said the idea was hopelessly extravagant, Hershey ultimately decided to fulfill a longtime dream of his and his wife, and build a hotel overlooking the town and his factory. Inspired by their travels, the Hershey's originally dreamed of recreating the elaborate Heliopolis Hotel in Cairo, Egypt which boasts an extravagant red-tiled estate affording royal suites, marble stairways, and vibrant gardens and fountains. Hershey's plan to build the grand Egyptian hotel was deterred when constrution costs were estimated to be over $5 million dollars. Hershey began developing a new vision for his hotel, giving his architect and chief engineer D. Paul Witmer a postcard of a hotel the Hersheys had enjoyed on the Mediterranean. In addition to the postcard, the Hershey's used various notes of their travels to incorporate into the design of the new hotel, including Spanish patios, tiled floors, foundtains, and a dining room with stunning views from every table. 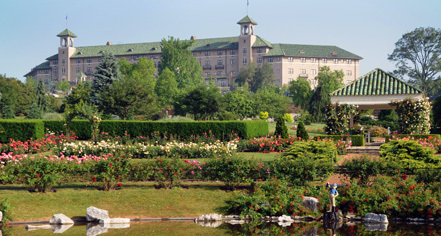 Through the years, The Hotel Hershey has experienced many additions and enhancements. 1935: The grand ballroom, named the Castilian Room, opened in June. 1935: In the fall, a wine cellar and the hotel's first service bar were opened after being delayed by Prohibition. 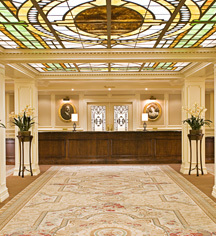 2009: The hotel unveiled its $67 million building campaign known as “The Grand Expansion,” which launched as part of the Hotel's 75th anniversary celebration. Dramatic upgrades included the Hotel’s front entrance, 10 new luxury guest cottages, one meetings cottage, a multi-pool swimming complex with an infinity-edge pool, year-round ice-skating rink, new recreation area, 130-seat restaurant, Harvest, and seven new boutique shops known as The Shops At The Hotel Hershey.